Bitumen-by-rail to the U.S. Gulf Coast currently provides less than 6 percent of the Keystone XL pipeline’s proposed capacity and total bitumen-by-rail imports into the U.S. are around 3 percent of the total capacity required to accommodate future Canadian crude oil production growth. Even with planned expansions, it appears highly unlikely that rail could replace proposed pipeline capacity. While planned projects could raise the capacity to load tar sands onto trains to around 800,000 barrels per day (bpd) by 2016, utilization of loading capacity has to date rarely exceeded 50 percent due to logistical and market factors that are expected to persist. If this utilization rate remains constant, this translates to a potential 400,000 bpd of bitumen-by-rail traffic by 2016. This falls far short of the 4 million bpd of total additional transportation capacity required by the tar sands industry to accommodate future growth to 2030. Unit train terminals, which are needed to load large quantities of bitumen onto trains, currently only load pipeline-specified diluted bitumen (dilbit), because pipelines are the only means by which large quantities of bitumen can be delivered to the terminals. This means that unit train shippers cannot avoid the diluent penalty (the cost of expensive diluent that enables bitumen to flow in a pipeline) when shipping bitumen by unit train. Therefore, tar sands producers have yet to accomplish the optimum configuration of unit train shipments of undiluted bitumen that has been cited by the U.S. State Department and others as being cost competitive with pipeline transport. It is also far from clear that this can be achieved at a significant scale in the future. Shipping dilbit by rail triggers significant safety concerns given the volatile nature of diluent, which is made up of a blend of natural gas liquids similar to those that have caused dramatic explosions during the recent derailments of trains carrying Bakken oil from North Dakota. Proposals to recover and ship diluent back to Alberta by rail in the same tank cars used for shipping dilbit to refineries would result in trains loaded with pure natural gas liquids, posing additional serious safety concerns. Only small-scale shippers are currently able to avoid the cost of diluent by shipping undiluted tar sands crude, and they face the higher cost of heating bitumen during loading and offloading, more expensive tank cars, and the higher shipping costs and slower delivery of the small-scale rail freight system known as manifest freight. While shipping undiluted bitumen via manifest rail may be practical in some circumstances for smaller producers, it is not a large-scale solution to major tar sands transportation bottlenecks. Increasing costs due to tighter crude-by-rail safety standards including the phasing out and retrofitting of the DOT-111 tank car and the imposition of speed restrictions. The debate around pipeline versus rail is a red herring. The real choice that we are faced with is between climate damage resulting from the status quo and a modern, low-carbon energy future that can ensure a safe climate and environment for generations to come. One of the first steps towards that future is to stop extracting more tar sands crude that climate science clearly indicates we cannot afford to burn. With new information and detailed analysis, this report confirms that rail cannot serve as a replacement for pipelines, and will remain a niche market for tar sands transportation. 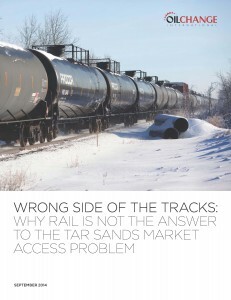 Rail simply does not have the capacity to unlock tar sands expansion. Technologies know as LENR aka Cold Fusion and also called CECR and QUAR and many related technologies like Hydrino will start mass production with in two years. LENR related systems are considered to be the holy grail of clean energy, with zero emissions or waste bi products and a sustainable fuel supply. Brillouin Energy has LENR powered boilers that can heat buildings and hot water. They also have another system that runs at 600 C capable of replacing the boiler system in large coal & power plants. BlackLight Power has a Hydrino technology that is very impressive also and again no pollution. LENR & Hydrino systems create 4 times the power of burning fossil fuels, at a fraction of the cost. LENR related systems are affordable to everyone on our planet. Lets make the top green invention breakthroughs as popular as soda pop. Invest 50 % into sustainable clean energy technologies. We have the technologies to replace fossil fuels, but investment in R & D And for mass production would speed things up greatly. Instead of investing, government red tape and road blocks are slowing the pace. The only way to slow climate change effects is to bring in new eco friendly technologies as fast as possible. LENR is the best eco friendly invention of our life time and where is the government investment and the media is no where to be found. We are not trying our best to replace fossil fuels and that will be mankind’s downfall. I have enjoyed many of your comments; but the problem lies in misinformation regarding fracking, rail safety and the overall misunderstanding of rail and crude oil. There is not one single thing that we use on a day to day basis that does not involve railroads or crude oil…. from the technology you speak of, your lights, to your belts, to the food on your table… all of which involve that which you all are against. Instead of point fingers… tell us your exact way to change that does not involve some form of transportation and some form of fossil fuels. Canadians weren’t sure if it was, Herr Harper or Chairman Mao Harper? What we do know is, Harper ain’t no Christian. He is far too evil for that.Harper has given Canada to Red China. If we remember? Harper gave China the right to sue any Canadians blonikcg Red China’s takeover of Canada. Ex BC Liberal Premier Gordon Campbell works for Harper. Campbell gave BC to Red China long ago. There are BC miners needing BC mining jobs. However, we all remember how corrupt BC’s judicial system is. Red China sued the BC miners for all of our mining jobs. The disgusting BC judicial court, gave Red China those BC mining jobs.We can forget about any resource jobs at the dirty tar sands too. Harper gave those to Red China as well.Still think we should keep Canada intact? That way China can take Canada over in one fell swoop. Or, should provinces have got the hell out of Chairman Harper’s Canada??? ?Baird is no different than Harper’s other ranting raving Comrade Ministers.